a wide variety of microhabitats, everything from tidal areas tofully submerged zones, and can thrive in a wide range of water temperatures and salinities. Their hard oval shell is divided into two halves, or valves (hence the term "bivalve") which can split down the middle to reveal a soft orange fleshy body inside. Mussels have two sets of gills, one in each shell half. The shells support the internal structures and form a hard-defensive shield against predators. A muscular foot protrudes from between the shell halves which aids the mussel in moving,burrowing, or in anchoring the animal to the substrate. The shells are typically grey to black in colour but can sometimes have abluish or even purple tint. Most mussels are a maximum of 4-5 cm in length, but they can grow to over 10cm in length. Mussels use their byssal threads (often referred to as their "beard") to attach themselves to rocks or man-made structures such as groynes (a wall or jetty), often located between the high and low water marks. Mussels usually cluster together in large groups (mussel beds),which can consist of hundreds or even thousands of individualmussels. Mussels are filter feeders that draw in seawater and filter it to consume the plankton and other tiny sea creatures floatingfree in suspension. Breathing also occurs as this water is passed across the gills. The common blue mussel (Mytilus edulis) is highly fecund and has a life cycle divided into several distinct stages. Musselsreproduce in much the same way as they feed—using the currents of the water around them. Blue mussels, as with all mussels,reproduce sexually. There are separate sexes (male and female), which release gametes (eggs and sperms) directly into the water. In spring, each female mussel ejects about five to 12 million eggsinto the water. At the same time, male mussels release sperm. After fertilisation, the fertilised egg begins to develop into a free-floating larval form of the mussel known as a trochophore. These larval mussels float around in the ocean and may be transported several hundred kilometres by sea currents, as their major body parts and systems develop. This free-floating larval form usually exists for a typical duration of three to four weeks, at which point it reaches what is known as the settlement stage Eventually, these floating larvae mature and attach themselves to a suitable growing surface, hopefully near other mussels. This could be a coastal rock, a pier, or as in the aquaculture industry acollector line. It takes a new generation of mussels between two to three years before they reach sexual maturity. The major spawning periods take place during the summer, although a major spawning may take place anytime from late spring to late summer. During theirspawning season, the mussels lose about one half of their meat weight. Although it is not fully understood what triggers mussels to beginspawning, we do know that water temperature and salinity playsan important role in determining the best time to spawn. Blue mussels are shellfish, and like all filter-feeders are extremely well suited to aquaculture. There is little to no risk of pollution or escape,and the effects to surrounding habitat from mussel farms arelimited. These filter-feeders actually benefit the surrounding coastal waters by filtering them, and mussels don"t rely on wild fish or fishmeal for food. Because of their ease of cultivation, Mussels have been farmed for hundreds of years. There were reports of mussel cultivation in 13th century France, where mussels were grown on wooden stakes. Today, Europe"s coastal waters are home to the highest level of mussel production in the world. The two major methodsof mussel farming are seabed cultivation and suspended cultivation. Seabed cultivation typically involves locating and fishing seedmussels of roughly 10mm length from offshore mussel beds and they re-laying them in a more productive and protected location. As soon as the mussels have matured, they are scraped from the seabed using a mussel dredging net. Called bouchots in France, where the technique ispredominantly used, this method of cultivating mussels takes place on poles or wooden stakes drilled deep into the muddy shoreline. Three to five metres of collecting rope or tubing (sometimes made of coconut fibre) is loaded with mussel spat and wrapped around the stake in a spiral. A netting material isplaced over the whole structure to prevent mussels from falling off. Regular maintenance is required in order to remove fouling. Harvesting is either done by hand or by machine. If by hand,workers cut the netting and catch the mussels in bins. Using amachine for collection, it will surround the pole and scrape the mussels off, depositing them on the vessel being used. Originating in Spain and popular in other locales around the world, raft culture is a method of growing mussels using afloating platform with rope or socking material hanging from the bottom. These ropes will collect spat and also be used to farm themussels through the entire growing cycle. As the mussels growand concentrate, they are thinned out or transferred to socking with a larger mesh size to allow for maximum growth. Rafts can be constructed from wood, HDPE plastic, metal, anyother desirable material, or a combination of many materials.Different sizes of rafts are used, yet the functionality of allowing the farmer to walk on top remains the same. Popular in New Zealand, this method entails the use of cotton socking sleeved over ropes. Buoys give the long line its flotation either on the surface. Inside the socking material, a rope provides the mussel seed with a substrate to adhere to. The socking material covers the rope and seed, and acts like a sleeve, allowing the mussels to grow to a marketable size. the depth of the water and preferences of the farmer. The cotton material biodegrades within a matter of months. While the benefit of continuous socking is an increased yield, consistency in size is a difficulty that many farmers must face. One of the ways they do that is to use extruded plastic socking material. A variation is the single drop method, which uses socking material hung from a single long line. Mussel spat is loaded into the socking material and each individual length of sock is hung from the long line. The length of each sock is dependent on thedepth of the water being farmed. As the mussels grow, they moveto the outside of the socking material, causing the material to actwith the characteristics of a rope. Humans are not the only ones who like to eat mussels. In themarine environment mussels face predation from seals andsea lions, fish, starfish, numerous species of seabird, and evenpredatory snails. Because they are filter feeders, mussels are at risk of pickingup contaminants from seawater. Some algae species contain naturally occurring marine biotoxins from the environment.These biotoxins can accumulate inside the mussels over time, which can pose a risk to consumers. Monitoring is needed toensure mussels are safe to eat. In a related problem, in some regions of the world, at varying times of the year, fresh mussels must be avoided from certain coastlines. For example, during summer months on the westcoast of the US, there is a danger of toxic planktonic organisms, or poisoning related to red tides. The red tides, caused by dinoflagellates, are harmless to mussels but toxic to humans.Consuming exposed mussels can result in serious illness, such as paralytic poisoning. Mussels contain lots of vitamin B12. A single serving provides more than the RDA (Recommended Daily Allowance) of B12! B12 is important because it is needed to make red blood cells,and is a vital part of many body chemicals found in every cell. Manganese is also found in large amounts in mussels. This mineral is used as part of enzymatic functions, bone formation and metabolizing energy from food. Mussels are also a good source of iron and of vitamin C, whichhelps the body better absorb iron. Iron is an essential part of hemoglobin, and helps support healthy immune function. Mussels are considered a high quality/complete protein, scoring 106 on the Amino Acid protein quality scale. 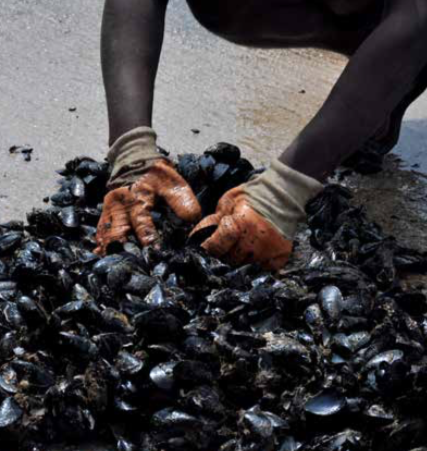 Worldwide aquaculture accounts for 95 percent of mussel production. The major production areas in are in China, Spain, Italy, Thailand, France, and New Zealand. The United States isa small producer of mussels, and imports them primarily fromCanada and New Zealand. Like oysters they can be cultured on-bottom or by suspension techniques, which account for 85 percent of production. There are very few outbreaks of diseases,and so chemicals and other antibiotics are rarely used. The overall production of mussels in Europe peaked at nearly 750,000 tonnes in the late 1990s and has since declined to about 550, 000 tonnes in the past few years. On a global scale, Europe is a major contributor of mussels, supplying over a third of thetotal production.